Point Au Roche State Park is an 856-acre (3.46 km2) state park in Clinton County, New York. 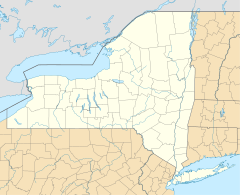 The park is in the eastern part of the Town of Beekmantown, on the shore of Lake Champlain. Point Au Roche State Park is a day-use park, offering a playground, picnic areas, biking paths, hiking, cross-country skiing, fishing, a nature center, and a sandy beach. Mooring for up to 60 boats is available in Deep Bay. ^ a b "Point Au Roche State Park". NYS Office of Parks, Recreation & Historic Preservation. Retrieved November 11, 2016. This article about a location in Clinton County, New York is a stub. You can help Wikipedia by expanding it. This page was last edited on 17 April 2018, at 13:36 (UTC).